Poor Sony. They are getting it from all directions these days. 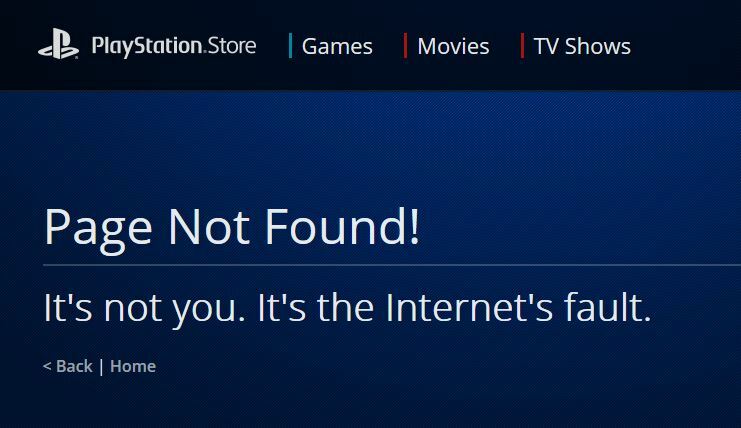 On Sunday, the PlayStation Network, the online store for games, movies, and TV shows, suffered a hacker attack and was knocked offline. Visitors to the store got a message that said, ‘Page Not Found! It’s not you. It’s the Internet’s fault.’ I just visited the page, and got this same message, so reports that it was up again, were at best, temporary – at least for some of us. Sony tweeted yesterday that they were investigating. A group called Lizard Squad, which was also involved in a hack of Xbox Live last week as well as previous attacks on EA Games and Destiny, claimed responsibility for the attack. During the Xbox hack, Lizard Squad promised that attacks would continue until Christmas. This attack comes on the heels of news recently that Sony Pictures' corporate network was infiltrated by cybercrooks which resulted in the theft of 100 terabytes of confidential employee data, business documents, and unreleased films. It was speculated that North Korean hackers were behind the attack due to the upcoming release of the movie "The Interview," which is about an attempted assassination of Kim Jong-Un. The North Korean government denied responsibility for the attack on Sunday. The attack has since been traced to a luxury hotel in Bangkok, and is being investigated. The two attacks appear to be unrelated.